adjusted to suit most plant types. Oderings Shrub & Tub Mix is suitable for use in all outdoor planting situations, patio containers, tubs, and raised garden beds. Powered by Total Replenish, this product contains long and short term complete plant food in NPK and trace elements. 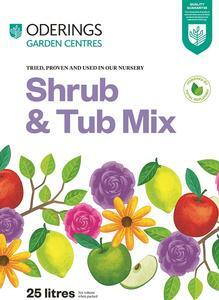 The ultimate fertiliser for pots and the garden. Best results are achieved when incorporated into the soil. Ordinary garden soil and products like this one may contain micro-organisms, some of which, on rare occasions can cause illness in humans. Serious infection is rare. However, for people with health issues or those with reducedimmunity, infection can be life threatening.